Having recently expanded its presence in the USA, fashion label Uniqlo has now teamed up with Ladurée, the famed French patisserie known for its macaroons. 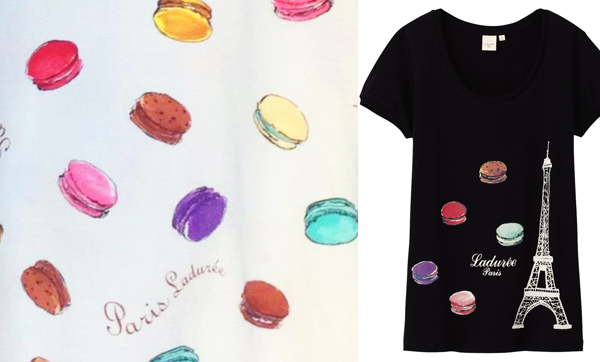 Inspired by Ladurée, Uniqlo is offering a range of tee-shirts featuring macaroons (the coolest contemporary confectionery), a black cat, a French Bulldog, butterflies, the Eiffel Tower, all in the Ladurée style. proceeds will go to IVY, a charity helping child-victims of the 2011 Japanese tsunami. Tasty: Ladurée tees by Uniqlo. 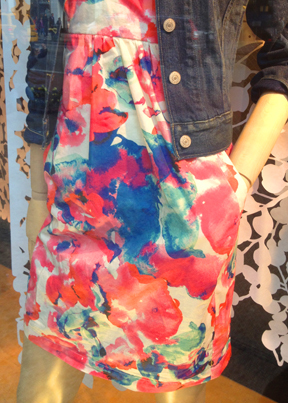 Convertible Tulip Dress by Levi’s, 2013. The origin of the Levis® brand goes back to the Gold Rush period. In 1853, the Bavarian-born Levi Strauss moved to San Francisco to open a dry goods retail company. Two decades later, Levi partnered with tailor Jacob Davis to create the first riveted, blue denim jeans. Today, Levi’s® is still known for its jeans. But the brand is also about its popular youthful menswear and womenswear lines. This season, Levi’s® is also showcasing big, bold womenswear textile print. 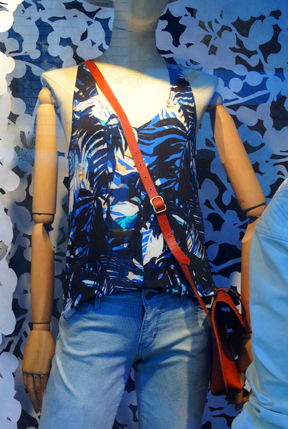 Palm Print Tank Top by Levi’s, 2013. Printed items include a “Convertible Tulip Dress” and “Smocked Neck Blouse” (both with bold, watercolor florals) and a Palm Print Tank Top. Among the more subtle prints and effects, Levi’s® also has a “Shibori Print Tee” in red and white or blue and white. Shibori is a Japanese term for what we might call “tie-dye”, although the effect is often more complicated and subtle. The Levi’s® Shibori Print Tee features a subtle, sophisticated, linear effect. 1. Placed print white denim shorty shorts by Aeropostale. 2. Floral denim cut-off women’s shorts by HIPPIE LAUNDRY. 3. Steffie printed stretch-denim shorts by Karl Lagerfeld. 4. Paint splatter denim shorty shorts by Aeropostale. 5. Mila Printed cut-off shorts by Rag & Bone at Saks Fifth Avenue. 6. Neon stripe denim shorty shorts by Aeropostale. You might think of Issey Miyake as the Steve Jobs or — if you’re thinking of the brand — the Apple of Japanese apparel and textiles design. Unlike other designers, who build on the history of their field and the designers that have gone before them, Miyake approaches clothing and textiles completely afresh. The question for Miyake, is ‘what should the garment do’? Or, in essence, ‘what is a garment’? Although he once said that he wanted his pleated clothing line — “Pleats Please” — to become an everyday classic like blue jeans, Miyake rethinks not just how clothing is worn, but the nature of their construction. Many of his earlier collections, in particular, drew from origami, and used folds and angularity to create more three-dimensional clothing. 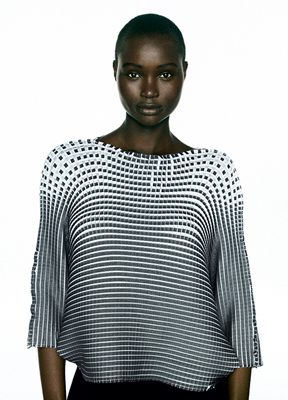 Print by Makiko Minagawa for Issey Miyake. 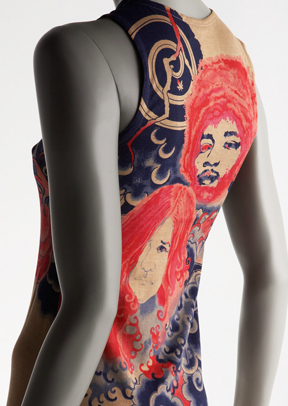 While Miyake’s earlier work focussed on construction and the fusion of different fabrics in single garments, over the last decade or so Miyake has shifted toward print and color in conjunction with pleating; working with textiles designers such as Makiko Minagawa, who created the well-known “Tattoo” Jimi Hendrix and Janis Joplin print. From traditional florals — used with non-traditional fabrics — to geometrics, placed-photographic and tattoo-inspired prints, Miyake has taken textile print from the level of the decorative to becoming an integral part of the clothing, by merging it with intricately structured and textured fabric that changes with the movement of the body. 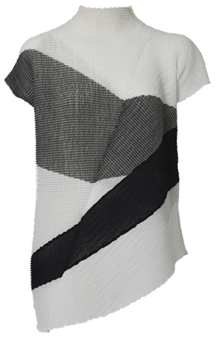 You can find out more about Miyake here. It’s “the smart, stylish design aesthetic that has made the HGTV HOME brand a success,” says Ron Feinbaum, general manager, consumer products, HGTV. May saw the launch of HGTV HOME’s fabric collection at Jo-Ann, the USA’s leading fabric retailer, and a representative for HGTV HOME fabrics. 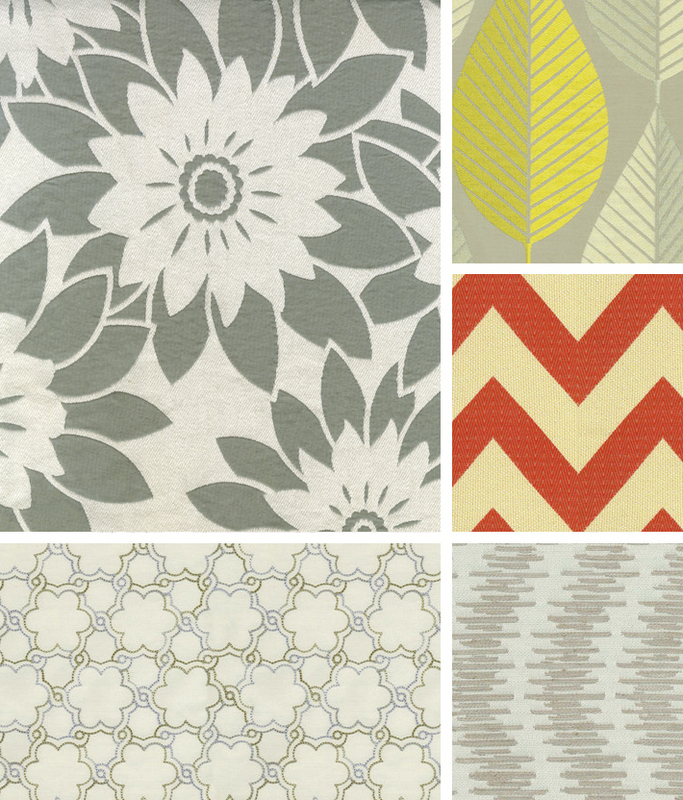 Jo-Ann is currently showing 30 styles in-store and over 70 at Joann.com. 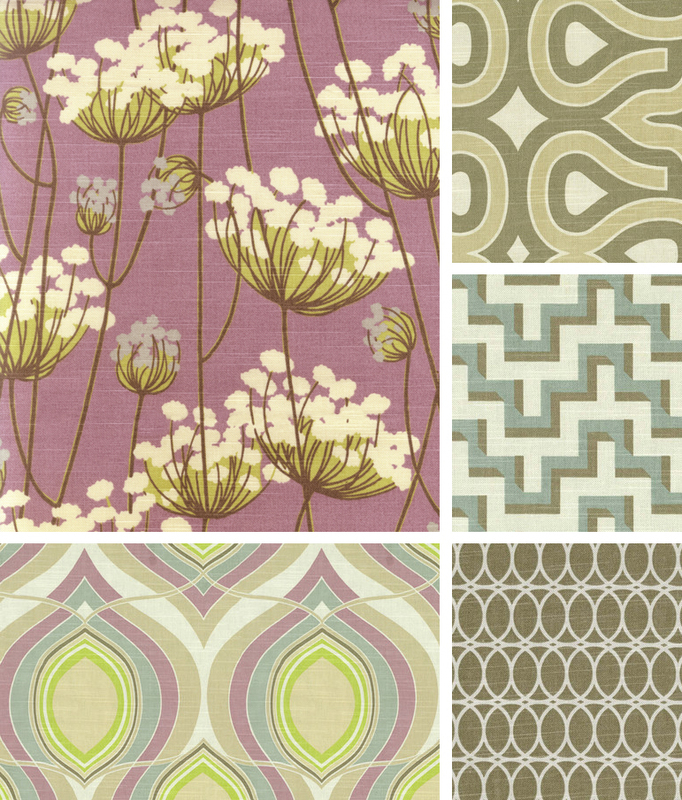 The HGTV HOME fabric collection includes printed, upholstery and outdoor fabric, in cotton or cotton mix, with pattern repeats either straight or half-drop. 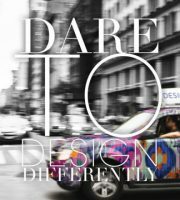 Drawing from a range of aesthetic traditions, and contrasting classic and new world design, the aesthetics range from bold and graphic to watercolor, with patterns ranging from geometric designs to florals. Distinctive colorways include emerald, turquoises, lavender, black, white and grays, as well as reds, spice colors, and gold. The HGTV HOME collection includes home products and paint, all designed to work together, to enable consumers to mix, match and juxtapose, to create smart, inspired spaces. A number of bloggers have already been using HGTV HOME fabrics to create pillows, lined lampshades, bags, and even iPad cases. Find out more at the IFDA blog, here. Ever think you’d see a photograph taken with an iPhone, and edited using Instagram, on the cover of the New York Times? Well, it just happened. As defined by Wikipedia, Instagram is an online photo-sharing and social networking service that enables its users to take pictures, apply digital filters to them, and share them on a variety of social networking services, such as media sites including Facebook or Twitter. A distinctive feature is that it confines photos to a square shape, similar to Kodak Instamatic and Polaroid images (in contrast to the 16:9 aspect ratio typically used by mobile device cameras). In Business Insider, Megan Rose Dickey says she feels that photographers using and iPhone and Instagram to take photos is a blow to the traditional photographers of the world. What is interesting is that Erin Lodi at connect.dpreview.com uses the example of the creativity of the artist where resources were at a minimum. As Lodi suggests, a photographer is an artist that has the ability to see things that others do not and record them. Not everyone with a camera is a photographer. If that were the case the world would be filled with Annie Lieibovitzs, Alfred Steiglitzs and Ansel Adams. The act of looking through the lens, or in the case of the Nick Latham for the New York Times, lifting your smartphone, does not make you an artist. To be able to see beauty through the view finder though learnable isn’t easy. Nick Laham is an artist. And he was presented with a difficult situation and used his resources wisely. Browsing the full gallery of the photos he took that day is the proof that it’s his eye that captured the beauty, not the iPhone. The traditional photographer insists on using film, decries the use of digital completely, and will say that anything less is not true photography. I believe that an artist should have awareness of all the tools in his toolbox, and digital falls into that realm. I appreciation for the process, but I also love the tools that the digital component adds. I gladly snap photos with my iPhone and have played with Instagram, but I see it as a novelty. The Alex Rodriguez portrait, or even the rest of the Yankees team that were taken that day, are quite nice and fit within the current pop culture format. How they will stand up to contemporary photos taken by true digital single lens reflex cameras is a discussion that will not happen for many years. Personally, I think that we traditional photographers are safe until someone invents the app that allows anyone to see the beauty in the world that only artists are able to find. No matter what filters Instagram comes up with or the tools that are added to Photoshop, it will still take the skill of the person. By James, Design Works International.